Government’s fifth Union Budget which was presented on February 01, 2018, had in store a slew of good news for the Digital Advertising sector. 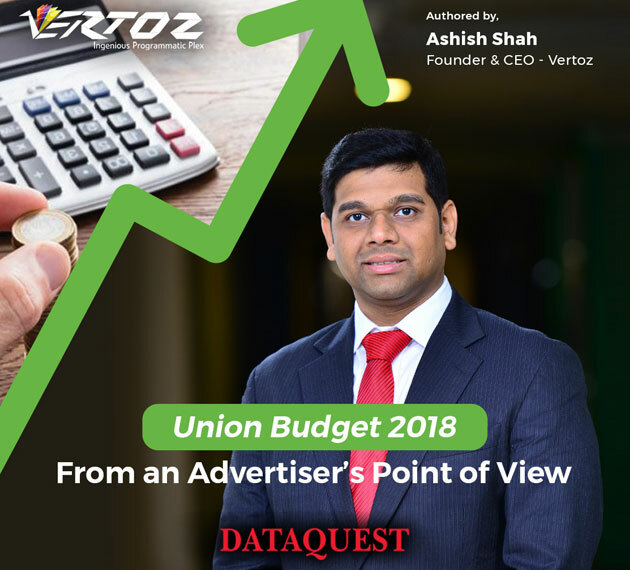 Vertoz’s CEO & Founder, Ashish Shah, listed some key takeaways for the advertising sector, in a brief article for Dataquest. Ashish says that the digital scenario in India has received a great boost. Finance Minister Arun Jaitley has doubled up the allocation for the Digital India scheme to Rs 3073 Cr. This has given a push to the government’s Digital India campaign, and in turn to ad-tech sector. The government also plans to invest in R&D in machine learning and Artificial Intelligence. Consequently, digital advertising can now come up with advanced technologies and algorithms to serve ads better, according to Ashish. Further, the government has allocated Rs10,000 crore, to provide 500,000 Wi-Fi hotspots in rural areas. This will empower 50 million Indians with easy internet access, and marketers will now be able to tap the huge rural markets and get more traffic. This is quite a positive news for the advertising sector. In his article, Ashish also stressed on the major issue of cybersecurity, currently faced by the digital advertising sector. However, with the Department of Science planning to launch a national program for cyberspace, he is now optimistic about addressing this problem. The Digital Advertising can now expect better digital infrastructure, giving it a boost. He also mentioned the market rejoicing over the reduction of the corporate tax to 25% on companies with an annual turnover of up to Rs 250 Cr. This will give the numerous startups a huge relief and enable them to look further in the direction of expansion, thus providing a boost and fostering growth for the Micro and Small Medium Enterprises (MSMEs). For more insights read the full article here.